The historical Galliera hospital in Genoa, Italy, is going through a significant refurbishment. Elisa Spallarossa, BIM manager for the project until June 2018, shares her experiences on how BIM can make a difference especially in information sharing among all project stakeholders. The Galliera hospital renewal is not only a reconstruction project, but very importantly, it also provides an opportunity for a cultural change within the hospital operations in terms of adopting new tools and ways of working, with easy and efficient information sharing becoming the essential factor. This extends beyond the AEC or new design and construction contexts, for which Spallarossa uses two examples: MEP data sharing in the INDICATE project, and information sharing among the hospital staff for workspace optimization. In the European Smart Cities INDICATE project, the aim was to support decision-making for urban planning and design by developing interaction between urban objects and spaces and optimizing infrastructure and technology to provide cost effective utility services. One of the pilot sites was the Galliera hospital, where Spallarossa took on the task to create an architectural model of the historic buildings. The task required a complex reconstruction of the available data, and data such as technical air handling, wall specific heating capacity, transmittance, conductivity, and exhaust flow rate were inserted into the BIM models themselves. The models were then exported from the authoring tool to Solibri Model Checker. With Solibri, 3D models and information takeoffs were used, instead of traditional spreadsheet methods, to easily share the data both with IES, the company to perform energy analysis scenario comparison, and with all the indicated consortium members using the free Solibri Model Viewer. This resulted in great advantages. First, collecting the information was faster and more controlled, and second, sharing it was intuitive, as it could immediately be visualized, understood and verified also by those who were not accustomed to using BIM tools. 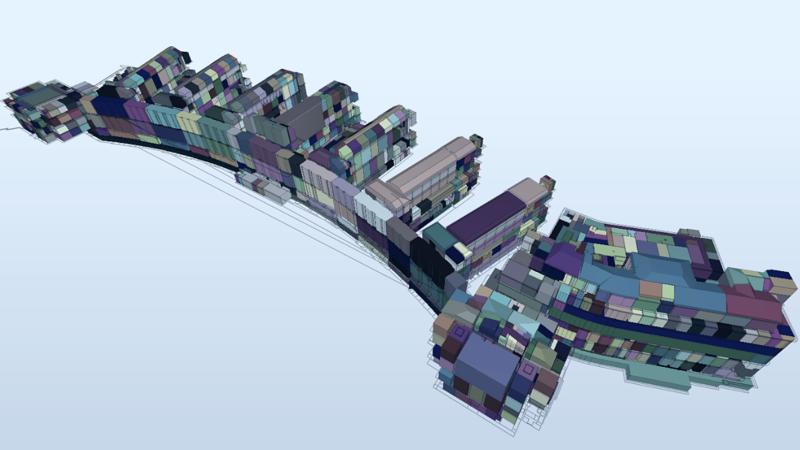 As a result, using the BIM models allowed a 30% reduction in time spent collecting and sharing the MEP data. For workspace optimization, using BIM models was introduced to share information for the medical workspace disposition both from space and scheduling viewpoints among the hospital staff, including engineers, doctors and nurses. The hospital procurement office, managing e.g. the cleaning services of the hospital, started using BIM models as a central data repository of room areas, occupancy and risk level, making the management of more than 3000 rooms not only easier but also much more cost efficient. Solibri Model Checker was used to develop information takeoffs for showing data in the same way that the procurement staff is used to seeing it with the spreadsheet, but now with the great further help of the 3D model intelligence. Thanks to this, for example, it was possible to locate orthopedics’ rooms close to lifts, and oculists’ rooms close to the waiting area. Using BIM models brought the hospital great advantages in optimizing the workspace disposition and they made it considerable easier for all stakeholders to immediately understand the data and design different scenarios. Evidently, it provided the hospital with an effective asset management system based on the as built data collected during the construction phase. MEP zoning of the hospital buildings with the information takeoff providing immediate area and volume data, and information takeoffs showing the ambulatory disposal both for the morning and afternoon occupancies. In the same way as the AEC chain benefits enormously from design and construction model sharing, asset owners and managers should also further develop the models and operational processes with the purpose of reaching the optimum of asset maintenance, that is, BOOM (BIM operation optimization model). However, it does not limit to that. Spallarossa brings out the ideology of beginning with the end in mind, a thought that should be found behind all BIM applications no matter which industry or how old or new the assets. BOOM should be seen as the single data repository for assets through which designers, builders, facility managers, and all different professionals such as doctors and nurses in case of a hospital, are able to share information and, most importantly, to collaborate. As ambitious goal as it may be, it is the key to reaching the great benefits of the digitalization evolution. Our main challenge is to make people understand what BIM is and what it’s for, that it’s not a bad contractual obligation! Practically, this means changing habits and getting people out of their comfort zone. "Solibri was an unambiguous choice when deciding on which program to use."